Welcome to Day #1 of Chocolate and Hazelnuts Theme Week. When summer turns to fall, I think of hazelnuts, and the Willamette Valley region of Oregon—where most hazelnuts in the U.S. are grown. 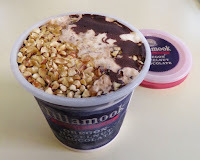 When I peeled off the lid of today's Oregon Hazelnut Gelato from Tillamook* (Tillamook, OR) I was greeted with a visual feast of nuts and chocolate. 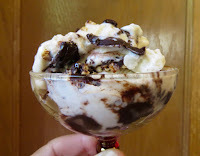 The top layer was so generally loaded with chopped hazelnut bits and fudge that you may want to mix this ice cream up a bit if you're sharing with friends. The first scoop had almost all the goodies. I prefer some layering of flavors—more than over-homogenized blends—so that individual flavors have room to shine, as they did today. The mouthfuls of chopped nuts contained authentic, somewhat bittersweet, hazelnut flavor; and the ice cream and fudge layers were tasty. *The Tillamook County Creamery Association is a 108-year old dairy farmer-owned cooperative based in Oregon that distributes dairy products including ice cream and gelato.